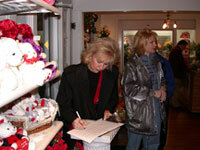 Knight's Flowers is in the News! 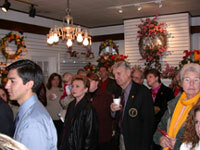 February 5, 2004 Knight's Flowers hosted a coffee for the members of the Anderson County Chamber of Commerce that was attended by over 40 business people. 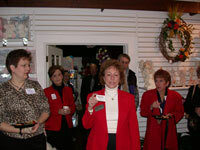 Jackie Nichols, President, Chamber of Commerce talks the crowd. Jennings Meredith, Emma & Susan Miller. Susan Miller, Jacki Kirk & Jeanne Underwood. 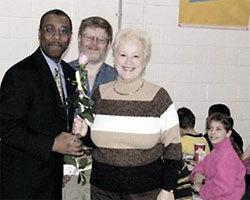 Dr. Jerry Woods (left), director of Clinton City Schools, and Dean Knight of Knight's Flowers presented roses to each member of the staff at North Clinton, South Clinton, and Clinton elementary schools, as well as the Central Office staff in honor of American Education Week, Nov. 17-21. They are pictured here with Betty McCarty, an instructional assistant at NCES. 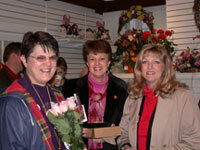 In addition to the roses, staff members were presented with a note, thanking them for their service and a coupon good for a discount on holiday orders. Courier News (November 23, 2003). Thank you so much for the beautiful rose, and the words of appreciation. It was such a thoughtful thing to do. I will certainly use the 25% coupon. I really appreciate your continued support for our students at CES. Donna Flood, 2nd Grade teacher, CES. Please accept my sincere appreciation for the donation of roses for American Education Week. I feel that the gesture was most appropriate and certainly well received. 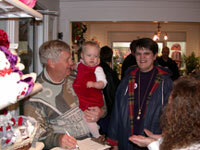 Many of the recipients have expressed their appreciation for your thoughtfulness. Again, thank you for honoring Clinton City Schools in such a special way. It was a wonderful surprise to see you Friday morning at our student and staff assembly program. 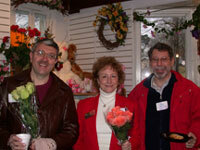 The roses you provided for American Education Week were a resounding success! As you could hear by the students’ response to each teacher and staff member receiving a rose, the teachers and staff of Clinton Elementary School are loved and respected by the students. 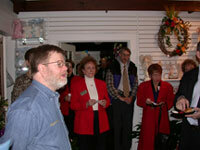 Your kind involvement and generous gesture donation of roses for the program are very much appreciated. Thank you for being a part of our school during American Education Week. Just a quick note to say thank you so much for the beautiful roses that you so kindly provided for each Clinton City staff member. The timing of the presentations was just perfect with it being American Education Week. We all appreciate you taking of your time and resources to recognize the work we do for our children. Again, thank you. Thank you for the beautiful roses you presented to us for American Education Week. Your act of kindness meant so much to me and my colleagues. Public education is taking a real beating right new, and it is so refreshing to be recognized in a positive manner. I’ve been teaching for over 20 years, and this is the first time we have all been recognized in a school wide assemble for American Education Week. Thank you again. Thank you for the beautiful rose you presented to me as a teacher at North Clinton. Your recognition of all school personnel was a delightful surprise. The rose is the prettiest and most long lasting one I have ever had. You truly know how to give the best! Thank you again. I appreciate your thoughtfulness. Thank you so much for brightening our day with the beautiful roses! You have made the world a better place!